Our luxury 4x4 camper is the perfect solution to enjoy your 4x4 camping experience in total comfort. 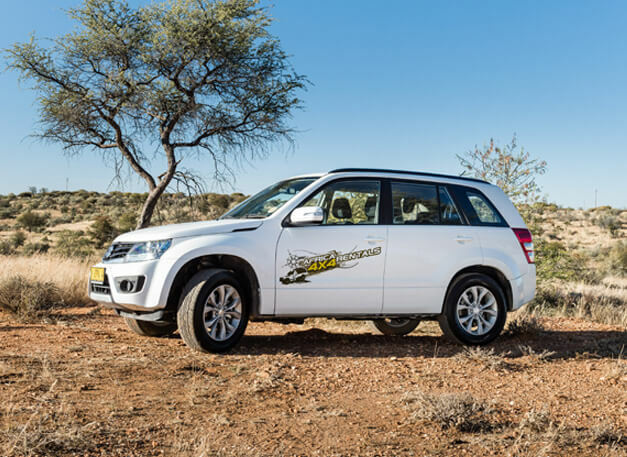 Enjoy your journey through Namibia in this amazing rental. Enjoy camping in luxury with our specialized 4x4 camper. Including all your basic needs and so much more. Make your Namibian trip an adventure with us. Safari gateway to South Africa, Zambia, Botswana & Zimbabwe … AND … a toilet to take with!!! We as a professional team at Africa 4×4 proudly offers to be the GATEWAY to this experience! Please look at our variety / range of vehicles, rates and camping equipment and then contact us for free advice and quotes! Many more… just ask for it… and… yes the best rates! All vehicles in our range are four wheel drive (4WD), rugged and withstand the test of time under rough African conditions. This is a Single Cab, suitable for tough off-road driving yet retains a high level of comfort and practicality. 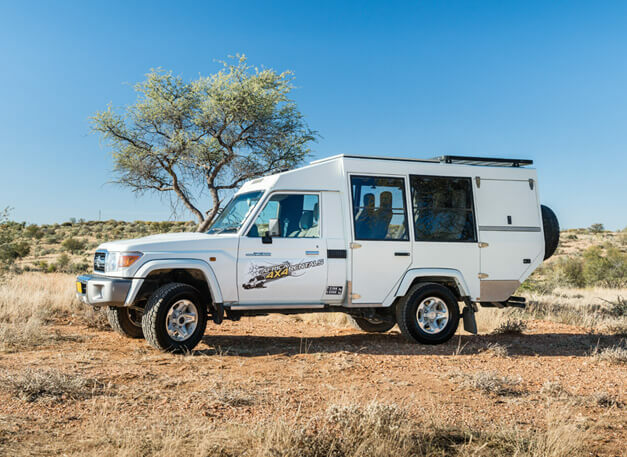 The rugged vehicles are built to take on the harshest conditions in the bush. 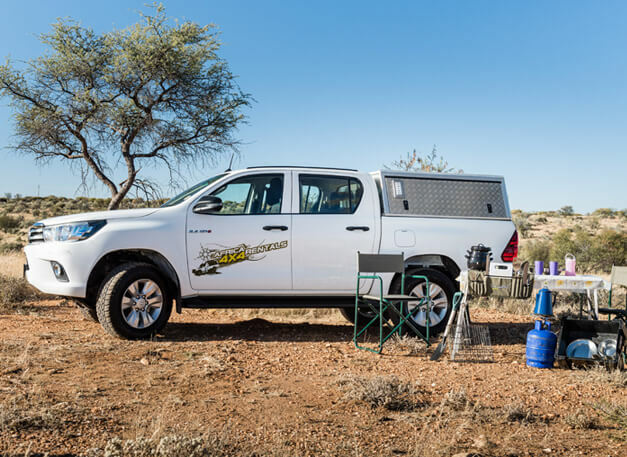 The vehicle is fitted with a canopy on the load box, but without any camping equipment supplied, it has a 150-litre long-range fuel tank. The Treveller carries 1-2 people in comfort with air-conditioning, power steering, radio / front loading CD player and electric windows as standard. This vehicle provides ample storage space and can be used for loads of luggage, camera equipment or other supplies you want to take with. *All rates are subject to change in accordance with changes in government taxes. *Airport Transfers to our depot in Windhoek are charged at N$ 200 p/p. *Transfers to our depot from anywhere in Windhoek are charged at a flat rate of N$400 (any number of pax). 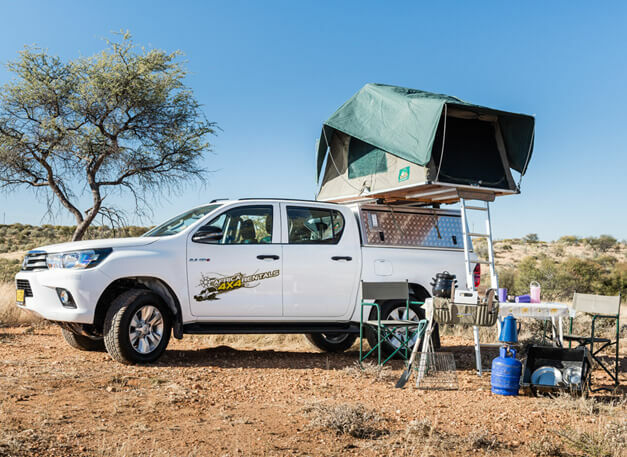 The Sleepy Traveller is a single cab chassis and suitable for tough off-road driving yet retains a high level of comfort and practicality. 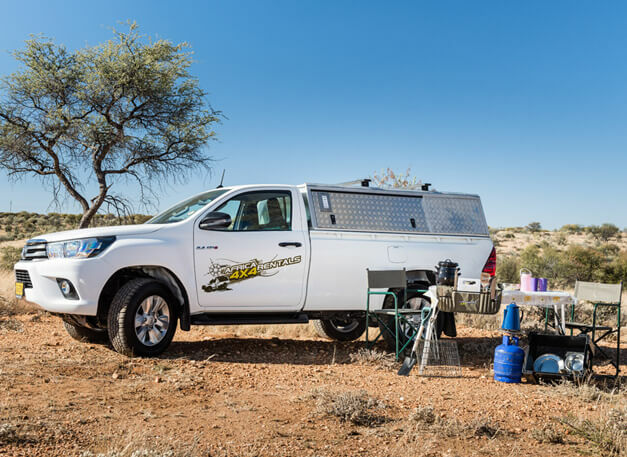 The Toyota engine is built to take on the harshest conditions in the bush. 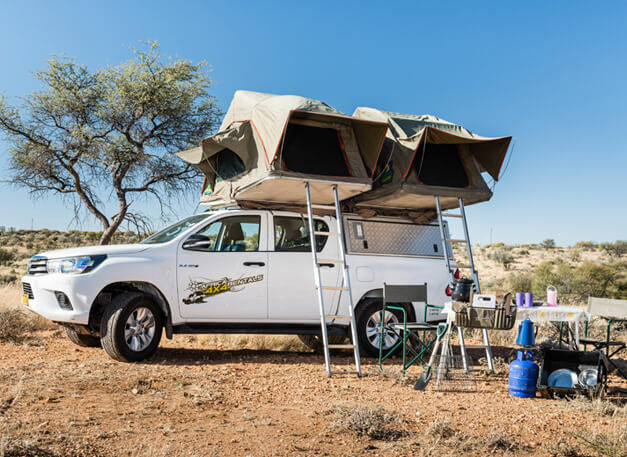 The vehicle is fitted with a canopy on the load box and does have a Roof-top-tent fitted on top. 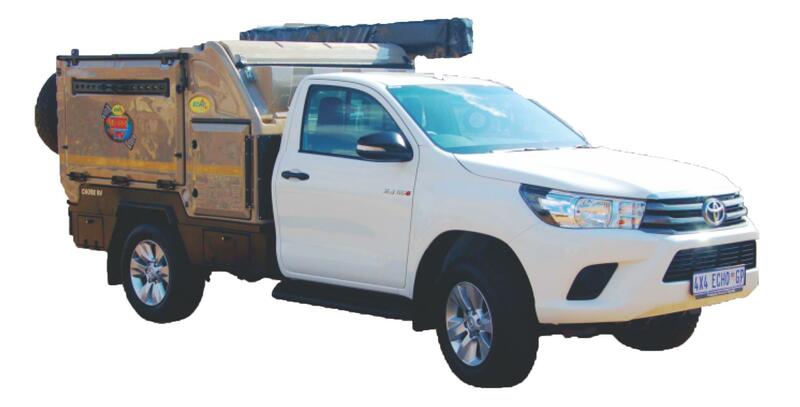 The standard list of camping equipment is supplied, it has a 150-litre long-range fuel tank. The Sleepy Traveller also carries 2 people in comfort with air-conditioning, power steering, radio / front loading CD player and electric windows as standard. This vehicle provides ample storage space and can be used for loads of luggage, camera equipment or other supplies you want to take with. All vehicles in our range are four wheel drive (4WD), rugged and withstand the test of time under rough African conditions. This is a Double Cab, suitable for tough off-road driving yet retains a high level of comfort and practicality. The Team carries 4-5 people in comfort with air-conditioning, power steering, radio / front loading CD player and electric windows as standard. This vehicle provides ample storage space and can be used for loads of luggage, camera equipment or other supplies you want to take with. The Sleepy Team is similar to the Team, but is fully equipped with camping equipment. The vehicle is fitted with a canopy on the load box. One rooftop tent is mounted on the roof, sleeping 2 adults on a double bed. 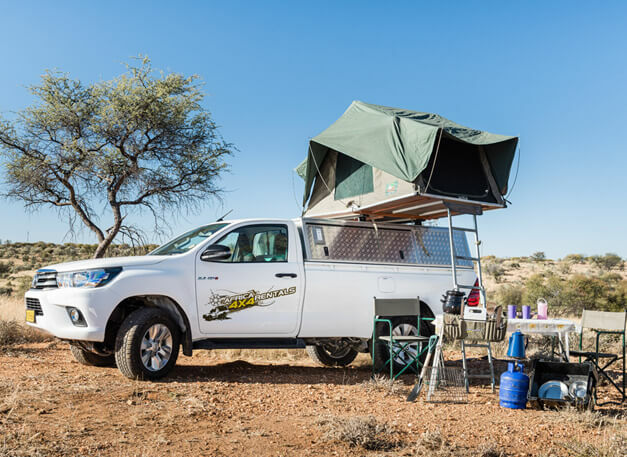 The load-box has been specially designed to accommodate luggage with an extensive list of camping equipment we experienced that you will need on your trip through the bush! A long-range 150-litre fuel tank is fitted. The tent opens up quickly and easily and provides great comfort. The Double Team is similar to the Team, also fully equipped with camping equipment. Two rooftop tents are mounted on the roof of the canopy. Sleeping 4 adults on double beds. This rugged 4WD double cab is built for tough off-road driving yet retains a high level of comfort and practicality. The load-box supplies plenty of space and can accommodate more luggage than what you can take on the airplane! The camping equipment will cater for four people. A long-range 150-litre fuel tank is fitted. opens up quickly and easily and provides great comfort. We have build a vehicle to accommodate that bigger families or a group of friends that would like to travel together. The Land Cruiser offers two seats in the front and 5 seats at the back, with a big enough luggage compartment, to accommodate your luggage and camping equipment. The roof can open for those who love to take pictures not through a window but outside. The vehicle is fitted with a sliding fridge and two spare tyres as well as a double tank. * Credit / Debit card compulsory. * Insurance options is additional to your vehicle rental and compulsory. * When excess amount has been chosen, you are liable up to that amount should something occur. * The excess amount will be blocked on your credit card. nice and helpful. They provided us 24/7 contact numbers. without problems and refunded by the Company. you next time in Nambia!! the country who are available to assist wherever required. expected, in large part because of Africa 4x4 Rentals. during the trip. Thank you! Best 4x4´s in Namibia. Good Vehicle in great conditions. Great company, great car and great people. 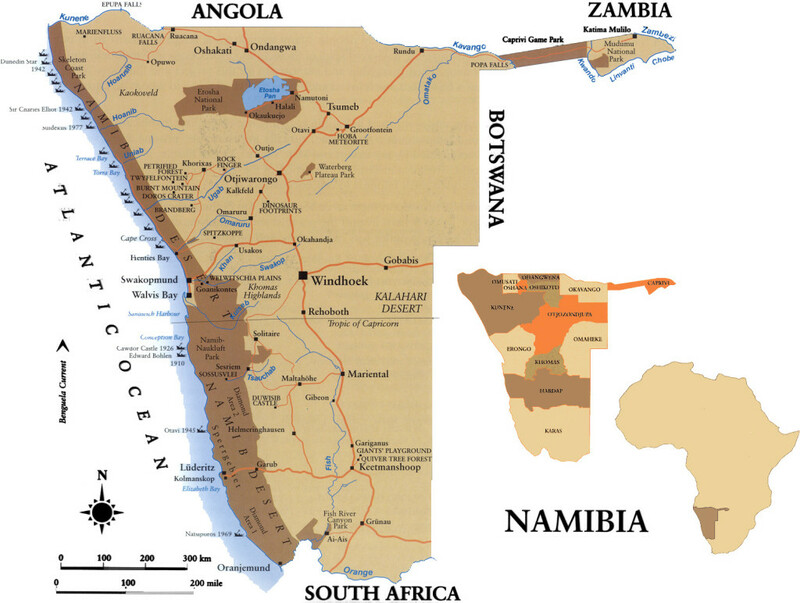 and friends interested in visiting Namibia in the near future. two other friends since we've been back. I have a void in me, feel incomplete! and lost in this world since we have returned the Toyota on Sunday.. 🙂 Just to say a special thank you for your excellent service and a truly memorable time in Namibia and a f*cking awesome vehicle and staff that made it possible. I have already recommended you to two other friends since we've been back. Keep up the excellent service and quality of vehicles and camping gear! We are back (to bad European weather) after a wonderful two-week round trip across Namibia, and the sleeper we rented with your company has played a very significant role in the very good time spent to discover some of the treasures of this wonderful country. Thank you and also thanks to your staff, very efficient people, both at arrival and departure. We will certainly recommend Africa4x4rentals to family and friends interested in visiting Namibia in the near future. Great company, great car and great people. Excellent service. 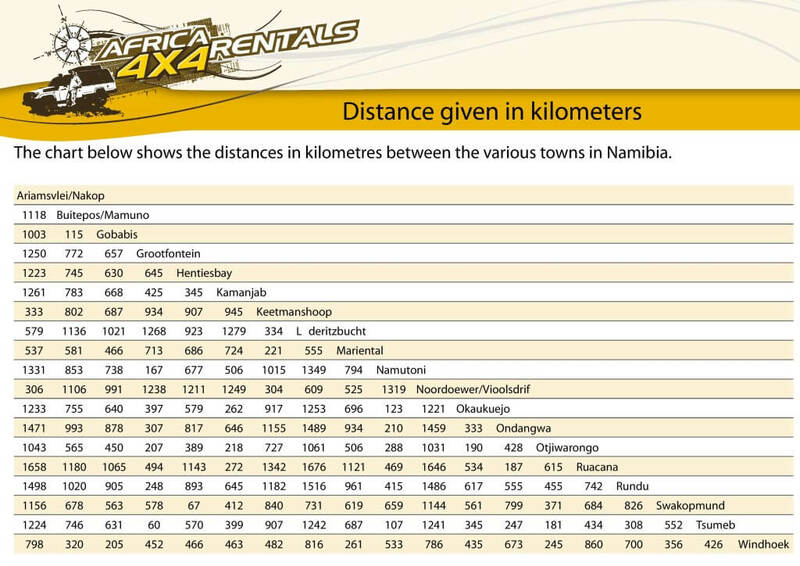 Best 4x4´s in Namibia. Good Vehicle in great conditions. Very friendly contact. We rented with "Africa 4x4 rentals" a single cab Toyota Hillux for two people. We drove in Namibia during 20 days around 3000 Km. Everything was fine with the car and we enjoyed very much our trip! The staff was very nice and helpful. They provided us 24/7 contact numbers. We only had a flat tyre during the trip that was repaired without problems and refunded by the Company. We would definitely choose again Africa 4x4 Rentals!! See you next time in Nambia!! We rent a 4x4 for three weeks with a rooftop tent (July 2017) and we were totally satisfied about our rent. The car had only 64.000 kms and was fully equipped (all camping material for cooking, but also for sleeping like sleeping bags and cushions, plus a table, chairs and even a napkin and a sat phone). The service is really good and is provided by a kind staff. They helped us finding a dealer in the region we were to replace our flat tyre. I can only recommend to work with them for any trip in Namibia. 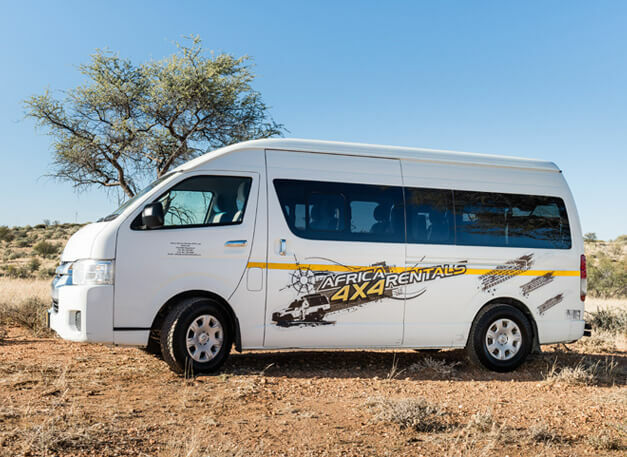 I can recommend this company for their outstanding service and advice, great value and the quality of their vehicle, which we rented for some two weeks to tour Namibia. We covered 3 000km without a hitch, travelling mostly on gravel roads. The vehicle was equipped with a dual fuel tank, a GPS device, two spare tyres and a small compressor (for re-inflating tyres when necessary). We also had the peace of mind that came with the insurance provided and service providers the company has around the country who are available to assist wherever required. Our trip to Namibia was every bit as amazing as we had expected, in large part because of Africa 4x4 Rentals. Our team of 4x4 hire engineers are always there for assistance. 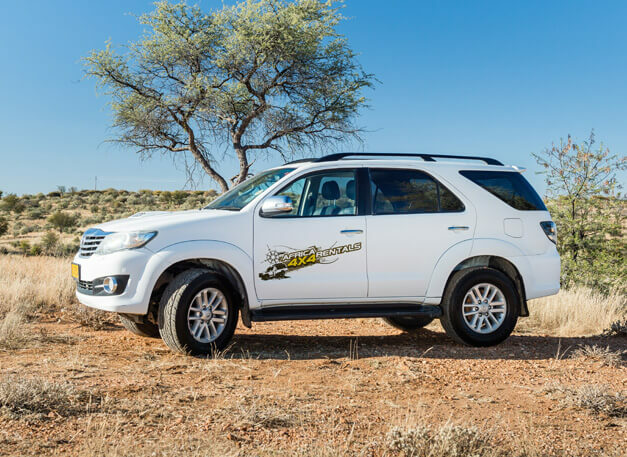 Come view our 4x4 car hire options before planning your next namibian safari.